SECOND SLICE: DISCOVERING THE SIMPLE JOYS OF WATERMELON POPSICLES - What About Watermelon? Summer is just over one week away, which means several things. More trips to the pool, more barbequed burgers for dinner, more watermelon and more popsicles. Today’s “Second Slice” gives you two things — watermelon and popsicles — at the same time. Now that I’m 40 (it pains me just to type that), I don’t eat a lot of popsicles. Luckily, I’ve got a four-year-old running around the house, and she loves popsicles. She’s also not shy about sharing them with me, so I’ve been able to indulge in the long-lost snack more often lately. The popsicles we buy are carefully chosen based on their combination of real fruit juice and overall healthiness. So when I saw a recipe on the National Watermelon Promotion Board website for “Watermelon Slice Popsicles,” I had to check it out. 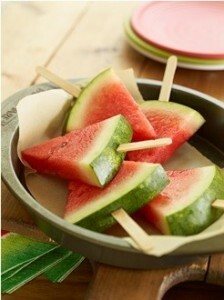 Turns out, it’s the simplest recipe they’ve got – just take a watermelon wedge and put a popsicle stick in the bottom! You can freeze the wedges, either fully or partially, to make them colder and even more refreshing. I tested them out with our little popsicle critic and she gave them two thumbs up. UP NEXT: The 2015 Watermelon Carving Contest has arrived!